Animal locomotion, in ethology, is any of a variety or methods that animals use to move from one place to another. Some modes of locomotion are (initially) self-propelled, e.g., running, swimming, jumping, flying, hopping, soaring and gliding. There are also many animal species that depend on their environment for transportation, a type of mobility called passive locomotion, e.g., sailing, kiting (spiders), rolling or riding other animals (phoresis). The order Insectivora is a now-abandoned biological grouping within the class of mammals. Some species have now been moved out, leaving the remaining ones in the order Eulipotyphla, within the larger clade Laurasiatheria, which makes up one of the most basic clades of placental mammals. Moles are small mammals adapted to a subterranean lifestyle. 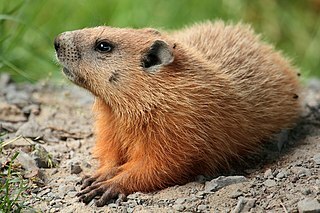 They have cylindrical bodies; velvety fur; very small, inconspicuous ears and eyes; reduced hindlimbs; and short, powerful forelimbs with large paws adapted for digging. The term "mole" is especially and most properly used for "true moles" of the Talpidae family in the order Eulipotyphla found in most parts of North America, Asia, and Europe; although it may also refer to other unrelated mammals of Australia and southern Africa which have similarly evolved the mole body plan. The term is not applied to all talpids; e.g. desmans and shrew-moles differ from the common definition of "mole". Burrows by birds are usually made in soft soils; some penguins and other pelagic seabirds are noted for such burrows. The Magellanic penguin is an example, constructing burrows along coastal Patagonian regions of Chile and Argentina. Other burrowing birds are puffins, kingfishers, and bee-eaters. 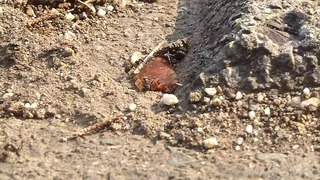 Examples of vertebrate burrowing animals include a number of mammals, amphibians, fish (dragonet and lungfish  ), reptiles, and birds (including small dinosaurs  ). Dragonets are small, perciform, marine fish of the diverse family Callionymidae found mainly in the tropical waters of the western Indo-Pacific. They are benthic organisms, spending most of their time near the sandy bottoms, at a depth of roughly two hundred meters. There exist 139 species of the fish, in nineteen genera. Wikimedia Commons has media related to Burrows . Invertebrates are animals that neither possess nor develop a vertebral column, derived from the notochord. This includes all animals apart from the subphylum Vertebrata. 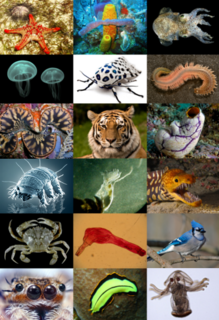 Familiar examples of invertebrates include arthropods, mollusks, annelids, and cnidarians. Echinoderm is the common name given to any member of the phylum Echinodermata of marine animals. 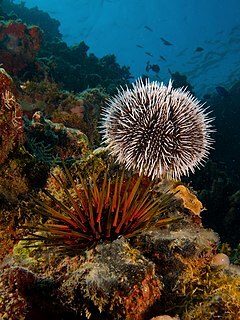 The adults are recognizable by their radial symmetry, and include such well-known animals as sea stars, sea urchins, sand dollars, and sea cucumbers, as well as the sea lilies or "stone lilies". Echinoderms are found at every ocean depth, from the intertidal zone to the abyssal zone. The phylum contains about 7000 living species, making it the second-largest grouping of deuterostomes, after the chordates. Echinoderms are also the largest phylum that has no freshwater or terrestrial (land-based) representatives. Nemertea is a phylum of invertebrate animals also known as "ribbon worms" or "proboscis worms". Alternative names for the phylum have included Nemertini, Nemertinea and Rhynchocoela.. Most are very slim, usually only a few millimeters wide, although a few have relatively short but wide bodies. Many have patterns of yellow, orange, red and green coloration. Image analysis is the extraction of meaningful information from images; mainly from digital images by means of digital image processing techniques. Image analysis tasks can be as simple as reading bar coded tags or as sophisticated as identifying a person from their face. Bioturbation is defined as the reworking of soils and sediments by animals or plants. These include burrowing, ingestion and defecation of sediment grains. Bioturbating activities have a profound effect on the environment and are thought to be a primary driver of biodiversity. The formal study of bioturbation began in the 1800s by Charles Darwin experimenting in his garden. The disruption of aquatic sediments and terrestrial soils through bioturbating activities provides significant ecosystem services. These include the alteration of nutrients in aquatic sediment and overlying water, shelter to other species in the form of burrows in terrestrial and water ecosystems, and soil production on land. Spatial ecology studies the ultimate distributional or spatial unit occupied by a species. 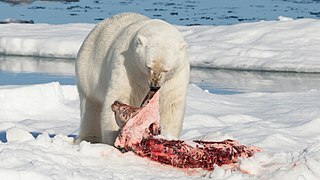 In a particular habitat shared by several species, each of the species is usually confined to its own microhabitat or spatial niche because two species in the same general territory cannot usually occupy the same ecological niche for any significant length of time. The great gerbil is a large gerbil found throughout much of Central Asia. Spatial epidemiology is a subfield of health geography focused on the study of the spatial distribution of health outcomes. An ichnotaxon is defined by the International Code of Zoological Nomenclature as "a taxon based on the fossilized work of an organism", that is, the non-human equivalent of an artifact. Trace fossils are classified in various ways for different purposes. Traces can be classified taxonomically, ethologically, and toponomically, that is, according to their relationship to the surrounding sedimentary layers. Except in the rare cases where the original maker of a trace fossil can be identified with confidence, phylogenetic classification of trace fossils is an unreasonable proposition. Paleodictyon is a pattern, usually interpreted to be a burrow, which appears in the geologic marine record beginning in the Precambrian/Early Cambrian and in modern ocean environments. Paleodictyon were first described by Giuseppe Meneghini in 1850. Spreite, meaning leaf-blade in German are stacked, curved, layered structures that are characteristic of certain trace fossils. They are formed by invertebrate organisms tunneling back and forth through sediment in search of food. The organism moves perpendicularly just enough at the start of each back-and-forth pass so that it avoids reworking a previously tunneled area, thereby ensuring that it only makes feeding passes through fresh, unworked sediment. Burrow fossils are the remains of burrows - holes or tunnels excavated into the ground or seafloor - by animals to create a space suitable for habitation, temporary refuge, or as a byproduct of locomotion preserved in the rock record. Because burrow fossils represent the preserved byproducts of behavior rather than physical remains, they are considered a kind of trace fossil. ↑ Wilschut, L.I. ; Addink, E.A. ; Heesterbeek, J.A.P. ; Dubyanskiy, V.M. ; Davis, S.A.; Laudisoit, A.; Begon, M.; Burdelov, L.; Atshabar, B.B. ; de Jong, S.M. (2013). "Mapping the distribution of the main host for plague in a complex landscape in Kazakhstan: An object-based approach using SPOT-5 XS, Landsat 7 ETM+, SRTM and multiple Random Forests". International Journal of Applied Earth Observation and Geoinformation. 23: 81–94. doi:10.1016/j.jag.2012.11.007. PMC 4010295 . ↑ Wilschut, L.I; Laudisoit, A.; Hughes, N.; Addink, E.A. ; de Jong, S.M. ; Heesterbeek, J.A.P. ; Reijniers, J.; Eagle, S.; Dubyanskiy, V.M. ; Begon, M. (2015). "Spatial distribution patterns of plague hosts : point pattern analysis of the burrows of great gerbils in Kazakhstan". Journal of Biogeography. 42 (7): 1281–1292. doi:10.1111/jbi.12534. PMC 4737218 . ↑ "burrow". National Geographic Society . 2012-06-06. Retrieved 2018-01-05. ↑ Dubiel, Russel; Blodgett, Robert H; Bown, Thomas M (May 1987). "Lungfish Burrows in the Upper Triassic Chinle and Dolores Formations, Colorado Plateau". Journal of Sedimentary Petrology. 57: 512–521. ↑ Varricchio, David J.; Martin, Anthony J.; Katsura, Yoshihiro (2007). "First trace and body fossil evidence of a burrowing, denning dinosaur" (PDF). Proceedings of the Royal Society B: Biological Sciences. 274 (1616): 1361–1368. doi:10.1098/rspb.2006.0443. 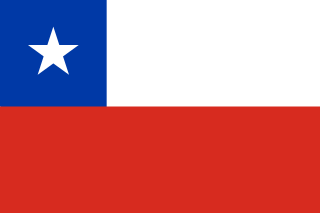 PMC 2176205 . PMID 17374596 . Retrieved 2007-03-22. 1 2 Donovan, Stephen K., ed. (1994). The Palaeobiology of Trace Fossils. John Wiley & Sons. ISBN 0-471-94843-8.